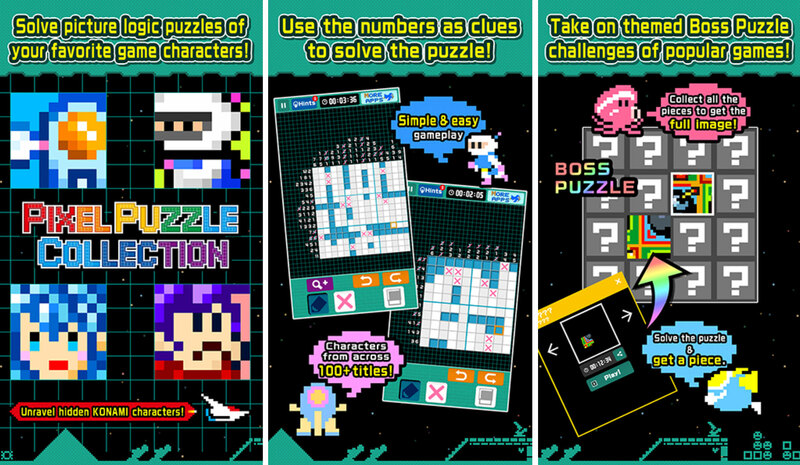 Picross is this sudoku picture puzzle that Nintendo normally makes which are a form of nonograms and this time Konami decided to take their own shot at it with a new app called Pixel Puzzle Collection since Nintendo owns the Picross name. We’ve had plenty of Picross themes before including Mario, Pokemon, Zelda and tons of generic ones but it’s nice to have one made by another company and their franchises, especially with one that has as many as Konami. The game is free to play with ads and apprently hints are limited so I’m guessing those will be sold eventually but playing for free is quite a nice experience. You start unlocking the amount of puzzles that you can do with a total of 4 different with one of them being the boss. The more you clear the higher the percentage you have and I played for a while until I reached some high star puzzles, I’m a bit stuck now since the puzzles that are left are a bit difficult for me but I’ve already gotten tons of enjoyment out of it. You start out with 5×5 puzzle grids which are quite easy but fun, then you move to more challenging 10×10 and I got to 15×15 which things get a little more difficult here. 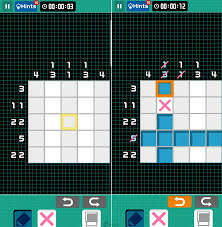 The game is similar to Sudoku but instead of numbers you fill out pixels based on the information that you have. The interface for picross is not as good as Nintendo’s best but it’s pretty good on its own. The puzzles are random so you might get stuck with one puzzle that is just way too hard for you but luckily you can just delete it and another will come. The best thing about the game is that you solve pixel character puzzles for franchises such as Frogger, Contra, Bomberman, Mystical Ninja, Castlevania, Parodius, Life Force, Gradius, Black Hole, Sunset Riders, Nemesis, Track & Field, Star Soldier, TwinBee, Milon’s Secret Castle, Yie Ar Kung-Fu, Crazy Cross and more from what I can tell. You also get a bit of trivia after you finish any of these puzzles and learn more about those franchises. There are 10 categories: Action (80 puzzles), Shooting (64), Thinking (58), Sports (44), Variety (46), Gradius (61), Parodius (28), Bomberman (51), School Girls (38), & Castlevania (30). You also have Boss and Midboss puzzles for a total of 500 puzzles.